Elegant and aristocratic wooden windows designed for historic interiors and buildings where it is necessary to preserve the historic style. These are also windows for modern buildings – by choosing decorative elements like headboards, carved ornaments, moldings or cornices in the final effect we achieve windows that look very similar to the old wooden window constructions: historic casement windows box, loom or one-frame windows. The content of this brochure is only a general presentation and it is not an offer within the meaning of the Civil Code. We reserve the right to modify our products without prior notice. Detailed information about our offer will be obtained in our company. Wood is a natural, eco-friendly material. 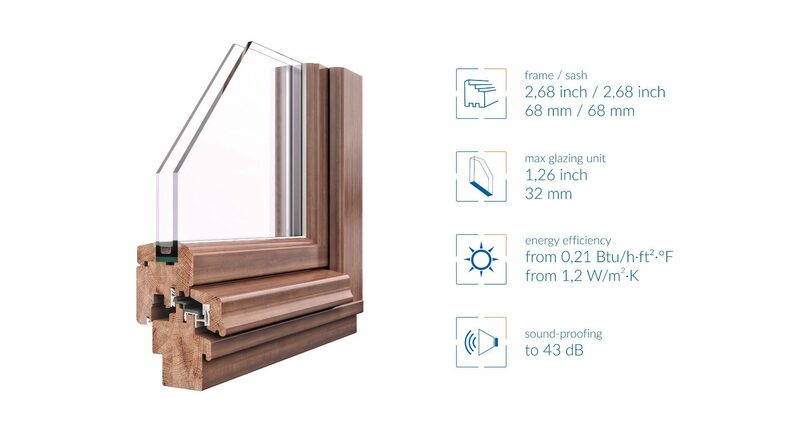 For the production of our windows, we use wood from certified forests, which is controlled by us at every stage – from transport from the forest to the window to the customer. Our windows are mostly produced from pine, oak or meranti. Modern wooden window frames are easy to clean and maintain, they can also be easily renewed and there color changed. Our products are spray coated with ecological acrylic paints. Available colors are very diverse. The palette of transparent (azure) colors perfectly emphasizes the natural structure of the wood, not covering it, but only giving the chosen shade. When using base paints from the RAL color palette, the wood structure is invisible. There is a possibility of differences in the grain and staining of individual elements. Covering coats accordint to RAL and NCS templates. An individual timber color has a significant influence on the final stain color coating. The palette of colors shown is used for demonstrative purposes only and cannot serve as a color reference. Presented colors are not a total available color range.